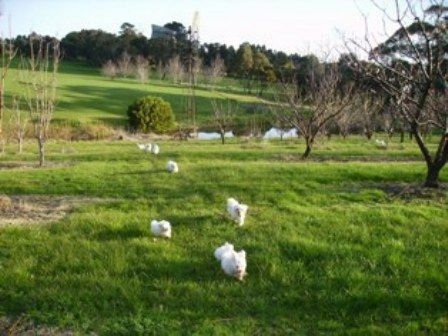 My name is Donna and I live in Albany, West Australia with my husband Nick, on an orchard overlooking Oyster Harbour. Our dogs are a part of our family life. Pups are born and live in our family room till they are old enough to go onto the verandah during the day, weather permitting. Pups go to pet homes where they will be loved and be a part of their new family. 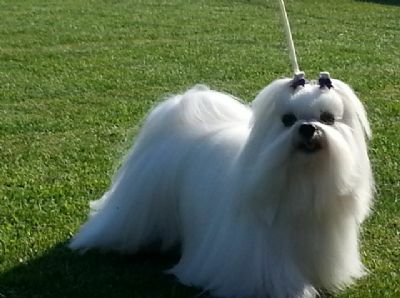 I have owned Maltese for 15 years. Chloe was shown for 2 years in Perth and I have bred pups for 10 years. I would like to give thanks to Janet Clark of "Mitzimist" for the joy Chloe and Stephanie gave to us and for the many times she gave advice, articles and knowledge freely. For being a friend who shared a love of these lovely dogs. Also a thanks to Jack Tetley of "Alouvetta" who shared his knowledge of showing and what to look for in a well balanced dog. It is a pleasure to have Shanae and to see her daughter Pippin grow so nicely and be a mother herself. A thanks to Inni Hoeksema of "Kalville" who sold me Snowman, and then Snow Magic who did so well in the show ring for her, gaining over 400 points. Snow Magic has passed on his good structure and happy nature to his pups. Ch Sunsnow White Magic. His parents are Pippin and Dice. I would like to thank Jhon Sheppard of Erintoi for Phoebe with her very friendly and sweet nature.